DevOps as a Service. Done Right. Most organizations lack the experience to maintain and evolve a successful DevOps solution over the long haul. Imaginet's DevOps as a Service engagement model enables an on-going relationship, focused on maintenance and continuous improvement of your DevOps (and ALM) practices. Schedule your free consultation call now. Accelerated Development & Quality. Ongoing. Imaginet‘s DevOps experts bring together decades of the best proven practices from development and operations to boost cross-functional collaboration and application quality. As a Microsoft Gold ALM & Azure Circle partner, Imaginet is recognized by Microsoft as having the expertise you need to help your organization start reaping the benefits of DevOps today. However, most organizations lack the resources to maintain and evolve a successful DevOps solution and, overtime, fall into disuse leaving no one to fix, test and make necessary changes to stay a float. Imaginet’s DevOps as a Service engagement model enables an on-going relationship, focused on maintenance and continuous improvement of the DevOps (and ALM) practices to ensure you continue to receive value from your investments and can evolve and improve over time. As a Microsoft Gold ALM & Azure Circle partner, Imaginet is recognized by Microsoft as having the expertise you need to help your organization start reaping the benefits of DevOps today. 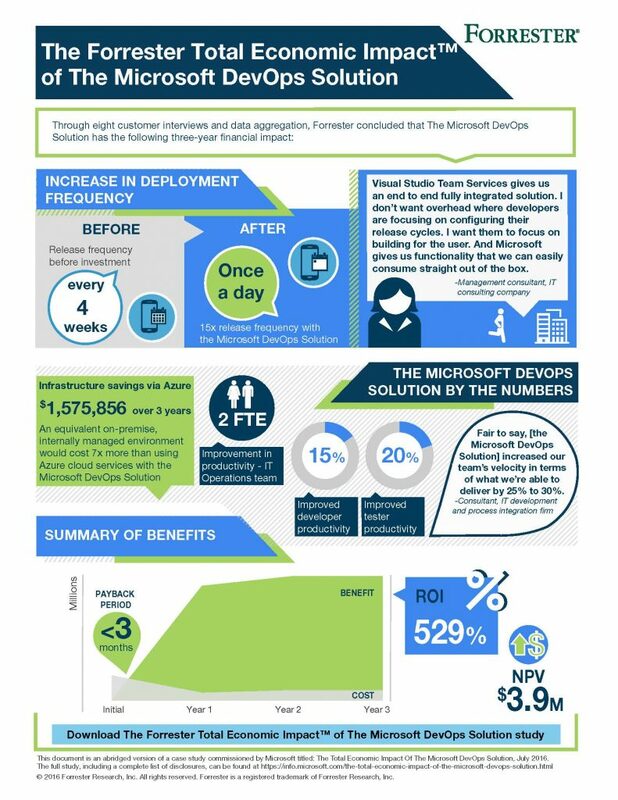 Click the image to download the Forrester Total Economic Impact™ of The Microsoft DevOps Solution study. With over 19+ years experience and over 1,100+ successful ALM engagements, Imaginet's ALM experts are ready to help you ensure the long-term success of your DevOps environments. Imaginet’s ALM team has designed, deployed, and mentored organizations on DevOps best practices and has real world experience. Your customized DevOps environment will be setup and configured with industry leading best practices and Microsoft Certified Consultants. Our consultant will ensure that best practices are tailored for your DevOps environment and integrate with organizational processes throughout the project. Our consultant can focus on those topics that are most relevant to your environment, team, and solution rather than broad coverage of topics that may not be relevant. Imaginet’s DevOps as a Service model enables an ongoing relationship, focused on maintenance and continuous improvement of ALM practices. Imaginet's ALM experts enhanced a company's project management capabilities while improving productivity and streamlining the development processes using Microsoft Team Foundation Server (TFS). Imaginet is a Microsoft Gold Partner in DevOps and ALM, Microsoft’s highest competency levels. DevOps as a Service offered worldwide.